As we begin the Jewish month of Shevat, we’d like to offer you a quick roundup of our posts from the past month (just in case you missed one or two!). Enjoy- and as always, feel welcome to provide us your feedback, and to leave comments with your thoughts on the subjects covered. Honest Prayer: The Greenest Shul in the World: For those of us yet to build holy arks from the neighbors’ fallen trees, this Evanston synagogue offers some pretty incredible examples on how to make a house of prayer more eco-friendly. A New, Green, Social Justice Movement in Israel: Hatnuah Hayeruka-Meimad: Learn more about how Israel’s new party plans on bringing change. Why Kyoto has Failed: Wicked Problems and the Wrong Trousers: What went wrong in the world’s efforts to cap carbon emissions? Can religious traditions help work out the kinks? Eating Holy Food in a Holy Way: Michael Pollan, the Omnivore’s Dilemna and the twelve tribes of Israel. 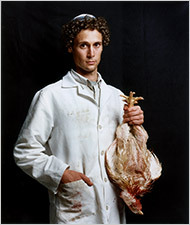 Meet the Meat: Local, Organic and Kosher Converge: Rabbi Sinclair on helping to slaughter turkeys- and eat them- at the Hazon Food Conference. Have you visited Climate of Change‘s Interviews page? What about our Reports Page? If you’ve enjoyed Climate of Change, we invite you to subscribe (for free) to receive posts via email, or sign up to our RSS feed. Chodesh Tov! Barack Obama’s inauguration marks a reversal of US policy on energy, environment and climate change. After eight years of climate change denial and deferral of action in the White House, Obama has announced that he’ll through the weight of the US behind the search for solutions. Phew. Not a moment too soon. As this interesting blog by points out, a 180 degree shift in attitudes towards science between Bush and Obama is one important driver of the policy reversal on climate change. 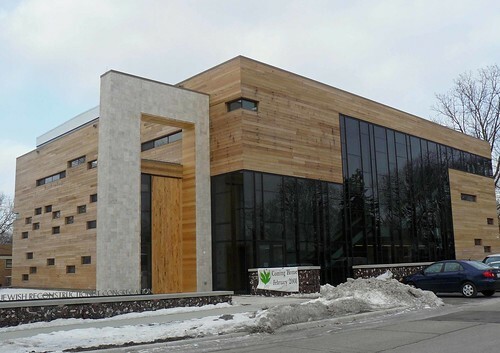 There is officially a new standard in sustainable synagogue building: The Jewish Reconstructionist Congregation in Evanston, Illinois (JRC). We’re not talking recycling bins. We’re not even talking local food for Kiddush. We’re talking an Aron Kodesh, the “Holy Ark”, built out of wind-fallen trees from the farm next door. Grounds decorated with native plants that don’t require irrigation. Low water volume showers, installed to encourage biking to shul. We are talking an entire, top to bottom, front to back to sides model of a building whose every brick, lighting and piping has been considered in the name of eco-friendliness. (They’ve got the recycling bins and local food, too). Thanks to Michael Shellenberger of the Breakthrough Institute for pressing into my hands “The Wrong Trousers”, a fascinating 50 page article by British social scientists Gwyn Prins and Steve Rayner that came out a year ago. I missed it at the time, so excuse me for chewing it over on the blog now. The title, “The Wrong Trousers” is, of course, a reference to the Oscar-winning animated film of that name in which the hapless Wallace (of Wallace and Gromit) is trapped in a pair of automated Techno Trousers which he thought would make his life easier, but in fact take him places where he doesn’t wish to go.